The materials we use to build our boats will lead us to a study of forest ecology, sustainable harvests, and the life cycles which link our material (wood), to the ocean upon which we will launch our boats. We note that Tlingit traditions have long embraced recent scientific views about these cycles. Wooden Boats Family Boatbuilding '98: 60 families, 60 boats, 1 weekend!!! Family Boatbuilding at Wooden Boat 99: 52 families, 52 boats!! 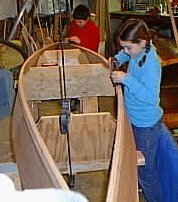 Mike Hanley's Anchorage 5th grade class build's Larry Westlake's "Yukon"
Building Bridges, Building Boats, a high school program to build the local "Hudson River shad boat"
Rocking the Boat in the Bronx, where Adam Green recruited teenage volunteers with sidewalk posters! Also, NY Times and Bronx Beat articles on the project. 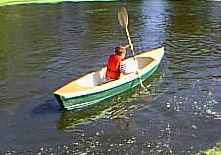 The Butz/Montague "6 Hour Canoe" and "Weekend Skiff" each have excellent "community boatbuilding" chapters at the end, about building boats in groups.